Kerri Simon's FITstl (Functional Innovative Training stl), located in Glendale, Missouri, is a small group personal training studio that provides an innovative approach to functional training and strength training. This is an awesome healthy family meal that includes sweet potato spirals that are available at Fresh Thyme! It doesn't even really need the cheese! Add olive oil to a large skillet over medium-high heat. Sauté bell pepper and onion for 3-5 minutes. Add garlic, saute for 1-2 minutes. Add the ground turkey and cook through. Add the ground herbs to the turkey. Add the fresh basil and diced tomatoes. Reduce the heat to low and simmer for 15 minutes. Slice the ends off of the sweet potatoes, peel, cut in half and spiralize with Blade C.
Add the spiralized sweet potatoes to the skillet. Toss and cook for 3-5 minutes. 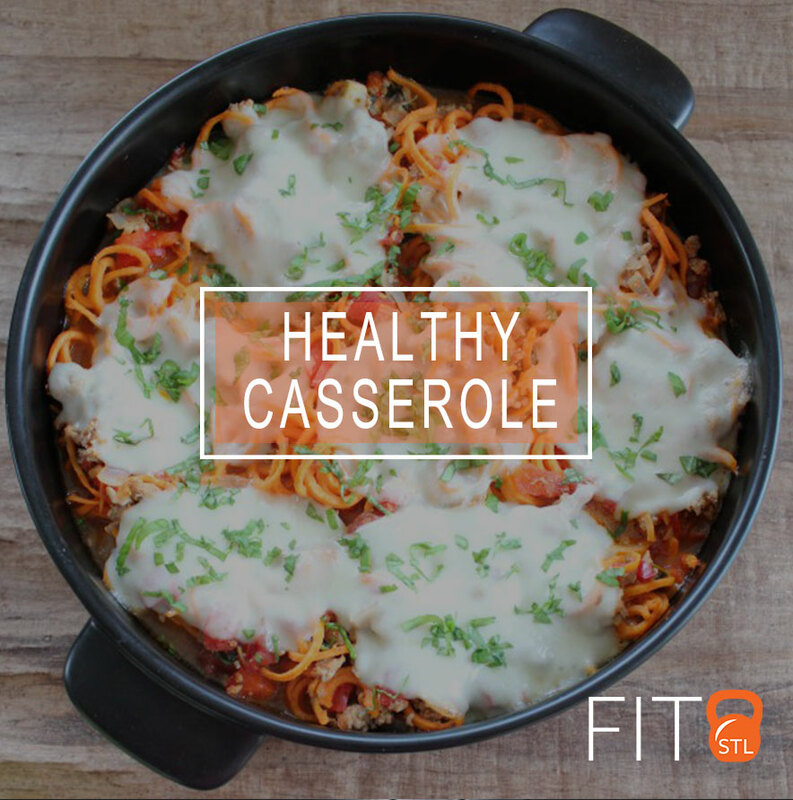 If the skillet is not oven safe, transfer the casserole to an oven-safe dish and top with the fresh mozzarella cheese. If the dish you are using on the skillet is oven safe, simply top with the fresh mozzarella and place in the oven. Cover and bake for 15 minutes. Uncover and bake 5-10 minutes or until cheese is melted and bubbling.